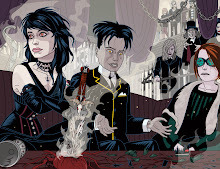 Just had these remarkable scans from David Slinn, who as you may recall was working in the UK comics industry during much of it's post war renaissance. 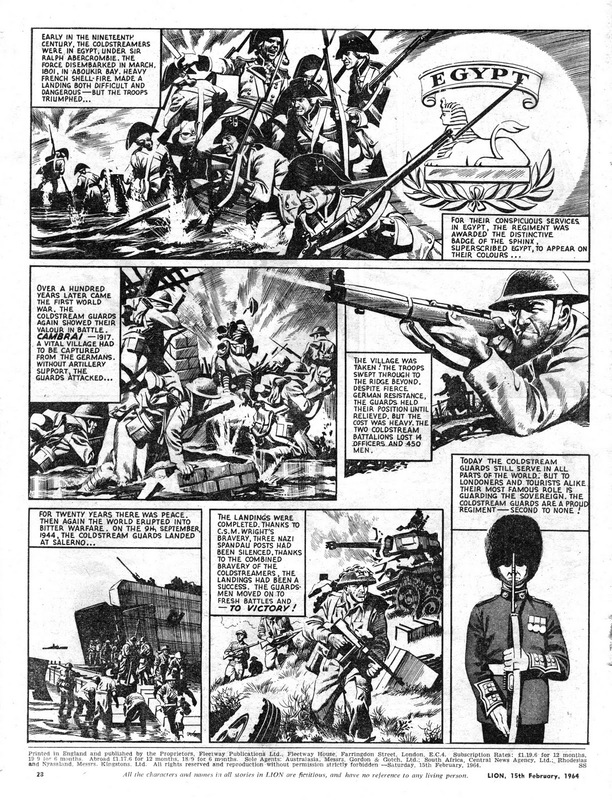 These two pages by the legendary Ron Embleton are quite surprising as by 1964, he had long ceased to do work for what were regarded as cheap and cheerful comics which Fleetway's Lion epitomized. However here he is, the doyen of full color rotogravure printing, apparently slumming it creating a two page strip where the crude color separations are done in house. A huge departure from the sort of color comic strips followers of Wrath of the Gods, Stingray or Wulf the Briton were used to. I can only presume it was one of those last minute phone calls from his agent Pat (or could have been father Don) along the lines of, " so and so is unable to do this two page strip - could you possibly fit this one in Ron?" Whatever - it's yet another example of this great artist's sheer professionalism and versatility. 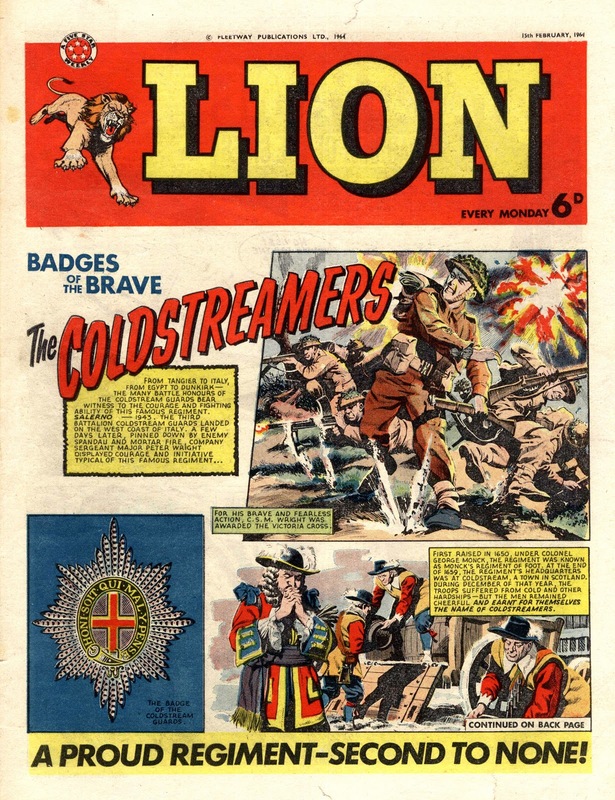 It's a nice thought that visitors to the newsagent that week would have had a chance to see Ron's Lion cover right alongside his brother's Olac the Gladiator strip on the cover of Tiger. 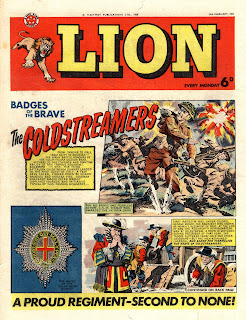 !964 was another busy year for Ron with other highlights including his only major work for Eagle on 'Johnny Frog' and a cover for the 1965 Valiant Annual which, strangely enough, turned out to be almost a mirror image of DC Thomson's second Victor Annual which went on sale at the same time! Looking at the typically masterful job he made of this dramatic image of two commandos in a canoe stealthily paddling away from an exploding German battleship one can't help but wish he'd found time to paint a cover or two for the War Picture Libraries. 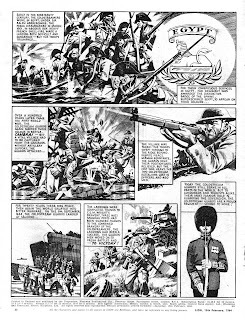 I love that artwork of the two commandos with the exploding battleship and the tracer zipping over the water, it's actually up on the British Comic Art Blog - highly recommended. You left off your list Phil, the cover he did for the TV21 annual. ... Oh yes - and the Stingray annual as well!